The highly acclaimed Horniman Museum Aquarium's has 15 living displays representing geographically correct biotopes from around the globe, including an historic Victorian Parlour display, a Fijian Coral Reef, Jellyfish, London Pond and a multi-taxa Iwokrama Rainforest. Our collection is made up of approximately 200 species of fish, invertebrates (aquatic & terrestrial), amphibians and plants. Research and conservation work is part of the ethos of the aquarium and behind the scenes are a number of facilities dedicated to supporting this work. Designed in 2010 our coral research system provides great flexibility for conducting coral related research. 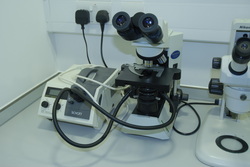 Whether an experiment requires a single system, four separate but identical systems or up to 40 subsets the research facility can accommodate it. Since 2011 we have been collaborating with Dr Mike Sweet at Newcastle University to investigate the causal agents responsible for White Syndrome, a major disease affecting corals. A number of experiments have been run using the museums live coral populations and Newcastle University’s genetic laboratories with the aim of better understanding the causal agents of disease. Our well equipped laboratory facilities enable us to closely monitor the water chemistry within our research system. A dedicated photomicrography suite forms key component of our research and enables us to accurately image specimens whether it be, a coral pathogen, larval stage of a jellyfish or specific anatomical feature of a subject. Our jellyfish culturing facilities behind the scenes have been continuously improved and expanded over the past four years. As a result we have successfully reared five species of jellyfish to date. It is generally accepted that the populations of certain species of jellyfish are expanding globally. Our collaborative research projects with Queen Mary University of London and University of Southampton aim to understand the effect this increased number of jellyfish will have on marine ecosystems and the food web. As part of these collaborations we have cultured over 1500 specimens and provided captive husbandry advice to facilitate research goals.